Canada’s largest federal public sector union is taking the federal government to court over provisions in last fall's omnibus budget legislation that limit strikes by federal workers deemed by the government to provide essential services. The Public Service Alliance of Canada filed its court challenge with the Ontario Superior Court on Tuesday. PSAC, with the support of more than a dozen other public sector unions, wants parts of Bill C-4 thrown out, claiming that they violate workers' charter rights: freedom of expression and freedom of association. The documents filed this week ask the court to declare the provisions are of no force or effect. They also demand that if the court finds that union members' charter rights have been violated, it must order the "reopening of any collective agreements negotiated while the above provisions…were in force, to allow the parties to exercise their right to collectively bargain with full recourse to the right to strike." Bill C-4 included amendments to the Public Service Relations Act that make it illegal for any bargaining unit to strike if 80 per cent or more of the positions in that unit are declared necessary for providing an essential service. It also says the government has the "exclusive right to determine that a service is essential and the number of positions required to provide that service." 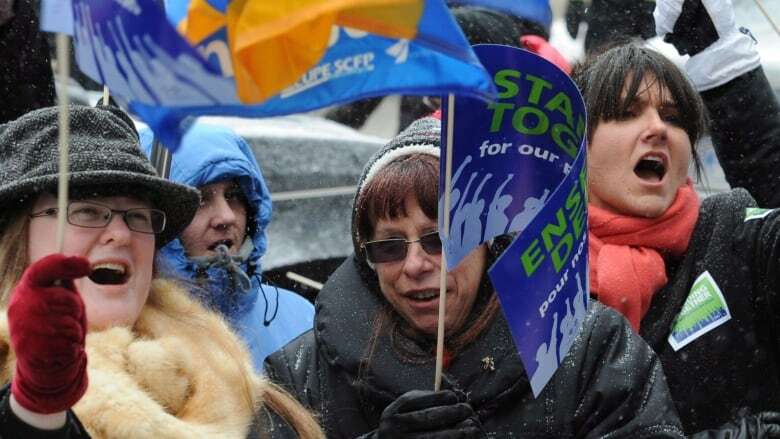 PSAC argues that violates its members' right to associate, which includes the right to strike. "The designation of employees under the Act is so extensive that it renders the freedom to associate and strike meaningless," the union's application says. PSAC says the former process to determine what was an essential service was fair and worked well. The union also argues the new law goes too far when disputes go to arbitration. The arbitration board is now required to base its decision on the government's ability to pay for wage increases and whether the benefits unions are bargaining for are necessary to attract more employees to the federal public service. Treasury Board President Tony Clement defended the measures when the bill was introduced last fall. "A democratically elected government should have the right to identify what Canadians consider 'essential services,'” Clement's office said in an email to CBC News at the time. The public service unions have also threatened to fight the changes to the Canada Labour Code, also embedded in the omnibus bill, but Tuesday's court filing does not include that challenge. Bill C-4, also known as Economic Action Plan 2013 Act No. 2, received royal assent on Dec. 12. This story has been updated to clarify that PSAC is Canada's largest union representing federal public sector workers.